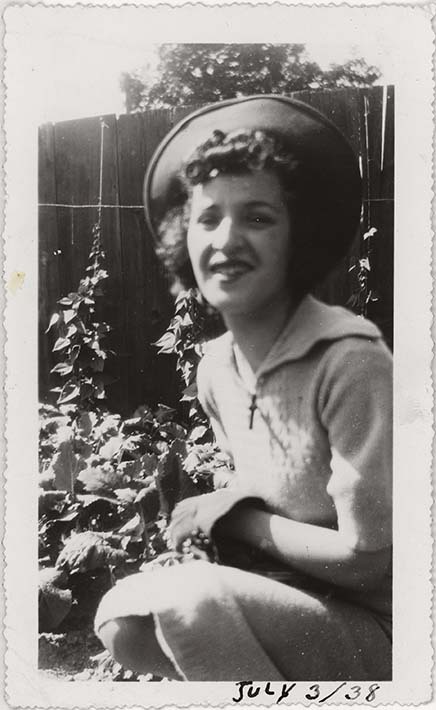 This is a black and white snapshot of Antoinette (Toni) Ciccarelli in a garden on July 3, 1938. It is a close-up of her crouching down beside some plants; she is smiling straight at the camera. Toni is wearing a tight fitting mid-calf length skirt, a short sleeve collared top and a sweater vest. A wooden cross hangs from her neck.. She is wearing a dark coloured brimmed hat, dark coloured lipstick and gloves. The background shows a fence and a tall tree on the other side of the fence. This photo was taken the same day as DICEA2010.0001.0045.